Following an extended loan period to Go North East, this vehicle has been returned to Wrightbus. 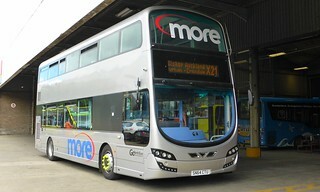 It will next see use at Oxford Bus Company, another Go-Ahead subsidiary, for further fleet evaluation within the group. 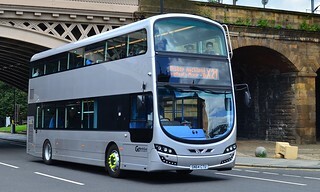 This vehicle has transferred from Chester-le-Street Depot to Percy Main, where it will be allocated to "DFDS Seaways" service 327, prior to being returned to Wrightbus, following extended loan. This vehicle has transferred from Crook Depot to Chester-le-Street. Following a few days use at Riverside Depot, this vehicle has now returned to service at Crook Depot, remaining in a float/reserve capacity. Remaining in a float/reserve capacity, this vehicle has transferred from Crook Depot to Riverside. This vehicle has transferred from Riverside Depot to Crook, in a float/reserve capacity. It replaces "Pronto" branded Volvo B7TL/Plaxton President 6021 (V921 KGF) in the fleet at Crook, which was withdrawn from service last month. 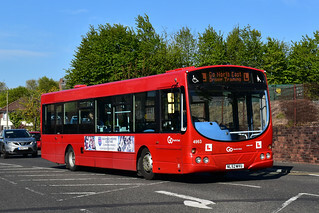 This vehicle has transferred from Percy Main Depot to Riverside, where it will see allocation to "Tyne Tees Xpress" services X9/X10 (Newcastle - Middlesbrough), to provide a trial against the Wright Eclipse Gemini 2 bodied Volvo B9TL on heavy endurance express work. 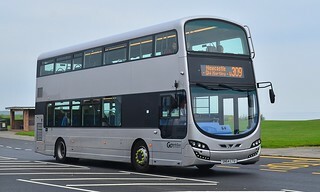 This vehicle has transferred from Crook Depot to Percy Main, where it will see allocation to "Cobalt Clipper" services 309/310, providing a comparison against the GKN flywheel modified Volvo B9TL/Wright Eclipse Gemini 2 vehicle on these services. This vehicle has entered service at Crook Depot on "Pronto" service X21 (Newcastle - Bishop Auckland). This vehicle has arrived into the Go North East fleet. 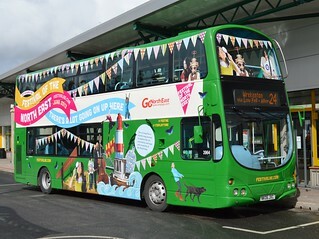 It is a Wright Eclipse Gemini 3 bodied Wright StreetDeck, and will be on a long-term demonstration period with Go North East. It will initially be allocated to Crook Depot for trials on "Pronto" service X21, but is expected to see use elsewhere on other services, too. The Wrightbus StreetDeck has been designed to deliver outstanding fuel economy and emissions through a combination of low weight, efficient driveline configuration and technology advances that reduce auxiliary power consumption. Fitted with a Daimler OM934LA 5.1 litre 4 cylinder Euro 6 engine; it forms an important part of the Wrightbus Euro 6 product line up, using many of the technologies and materials developed for the highly successful New Routemaster. Following the completion of modifications at Thornton Brothers, Ashington, this vehicle has returned to service within Riverside's Driver Training fleet.